MANILA, Philippines—It all begins and ends with the warrior code. The public humiliation of Angelo Reyes by a junior Cavalier may have driven Angelo Reyes to fire a bullet through his heart, according to retired Maj. Gen. Leopoldo Maligalig, a former superintendent of the Philippine Military Academy (PMA). The attack on Reyes by Sen. Antonio Trillanes IV at a Senate inquiry was an assault on the PMA that hurt Reyes deeply, Maligalig said. Maligalig said he was saddened that the PMA was being dragged and maligned in the course of the congressional investigations on alleged irregularities in the Armed Forces of the Philippines simply because the players involved were PMA graduates. “Everything begins at PMA. It is a nucleus of AFP value formation, and a warrior’s honor code. To be humiliated in public by a fellow Cavalier and a junior officer at that … I know that hurt Angie very much,” Maligalig said. 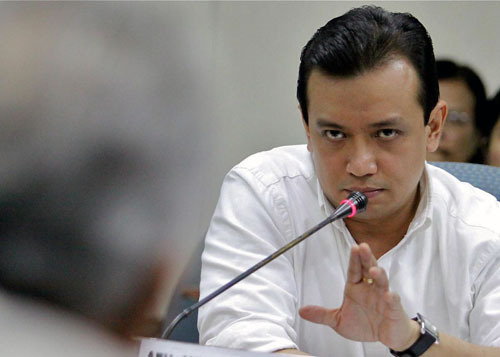 “We were shocked at the demeanor of Senator Trillanes. Senators are senators, and PMAyers are PMAyers. The attack was no longer on personalities. It was already against the institution,” he added. PMA alumni are called Cavaliers, regarded as part and parcel of a prestigious brotherhood. During the Senate hearing last week, emotions ran high when Reyes tried to respond to accusations that he skimmed off military funds when he was AFP chief of staff and received P50 million on his retirement, charges he indirectly denied. As a Navy lieutenant, Trillanes led a short-lived mutiny in 2003, seizing the posh Oakwood apartment hotel in Makati City, calling on then President Gloria Macapagal-Arroyo to step aside for corruption before surrendering. He was jailed for over seven years but was provisionally freed in December last year. He later applied for amnesty. As AFP chief of staff, Reyes in a crucial moment in the move to oust then President Joseph Estrada in 2001, also on corruption allegations, withdrew support from his Commander in Chief in what he later said was an attempt to preserve the divided military. The four stars on the shoulder pads of Reyes shine even brighter in his death, leaving a legacy of honor and courage that may be difficult for men and women in uniform to emulate, Maligalig said. “His death is bigger than his illustrious career and his life. His death is a wake-up call for all of us to protect the institution that we dearly hold. His death becomes a rallying point for the institution and I think it gives us time to pause and reflect on what he died for,” Maligalig said. Retired Maj. Gen. Rufo de Veyra, also a former PMA superintendent, said he admired and respected the “extreme courage” of Reyes to end the siege on the military institution by offering his own life. “When I read about his suicide, I cried. It was the first time I cried unabashedly,” De Veyra said. De Veyra said what Reyes did in the end—an act likened to a samurai in ancient Japan committing seppuku—was not a question of right or wrong. All situations, he said, are unique to every individual, and being right or wrong is something personal. “It brings us face to face with our mortality. In the end, Angie chose the honorable way out. I suspect that his grand exit will be a constant source of wonder and awe especially for some of us fortunate enough to have known him. “I can already see him yonder now with his impish smile,” De Veyra said. In warriors perspective a sign of bravery in layman’s view a cowardly act. Suicide is a cop out, no matter which way one looks at it. A samurai or bushido warrior commits seppuku rather than suffering humiliating defeat, or capture, by the enemy, and that’s a whole lot different than suicide to avoid humiliation. When you come down to the nitty gritty of it, he abandoned his family to their shame. The warrior way, if he were truly without guile in this matter, is to fight to death and stand by his family and his Alma Mater. PMA alumni are called Cavaliers, regarded as part and parcel of a prestigious brotherhood”, but what about the soldiers fighting in the field with sub-par boots, minimal rations no available medivac helicopter because some general is using it in Borocay to play golf? Where is the brotherhood with this? PWEH! Makes me wanna vomit! They took care of their pockets, when the crap hits the fan they all point fingers at each other some brotherhood. I am not with both cavaliers(Reyes or Trillanes). As PMA graduate upper classman should be always be higher than a lower classman that’s why lower classman is always addressing “SIR” & YES SIR by thier subordinates whether the higher officer is wrong or not. Now they belong to thier own respective life & with responsibilty to fullfil. Mr.PMA Superintendent current or retired the assault of Sen. Trillianes is part of his duty & responsibility as an Administrative in the Senate & not as a PMA cavalier. If former Chief of staff (Reyes)is hurt by way he tackle it. Then that is his fault. Any member of Senate Committe has to do what is suppose to ask to any resource person. They (resource person) are being taking outh in front of the body of Senate Committee before they will start their true revelation. Nothing but true. Hindi mag-sisinugaling sa body ng Senate Committee. Pero hindi nag-sasabi ng kato-tohanan ang iba. Sayang graduate pa naman ng PMA. Naka-kahiya sa boung bayan.Pinag-aaral kayo ng pera ng bayan para pag-graduate ninyo sa Academy ay mag-silbi kayo sa Bayan hindi sa sariling pang-interest lamang.